ROCHESTER, N.Y. - The Holy Cross women's hockey team earned its first tie of the season, 1-1 against RIT, Saturday afternoon in New York. The Crusaders (0-1-1) battled hard and drew first blood, but couldn't convert on another score to grab that first win. The Tigers (1-0-1) remain undefeated on the young season. 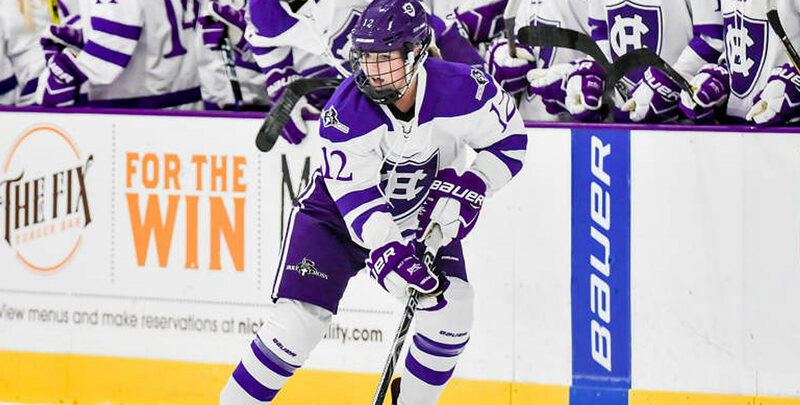 For Holy Cross, freshman Carlie Magier recorded her first goal of her collegiate career and seniors Danielle Doherty and Amanda Kewer picked up their first assists of 2018-19. Freshman Jada Brenon made her first start in goal and grabbed 29 saves, including 16 in the first period. 1-0 HC (1st, 11:53, EV): Kewer recovered a loose puck in the defensive zone and quickly sent it up to Doherty who fired a shot from the right side. RIT's Lanteigne made the deflection save, but Magier was right there after streaking down the left side to get the rebound and sink it into the open left side of the net. 1-1 RIT (1st, 18:25, PP): With less than two minutes remaining in the first period, the Tigers converted on a power play when Ellie Larson found the back of the net with help from Kendall Cornine and Brittney Gout. - RIT out shot Holy Cross, 30-25. - The Crusaders went 0-for-2 on their power plays, while the Tigers went 1-for-5. - Brenon recorded 29 saves to Lanteigne's 24. - The assists for Holy Cross were Doherty's 20th of her career and Kewer's 15th. The Crusaders will have a week to recover and analyze this opening weekend's games before taking the ice again next Saturday at RPI.